"How often have you heard of a broken cylinder hold-down stud? A crankcase thru-bolt? All such failures are closely related and add up to be one of the most frequent types of structural failure experienced in piston aircraft engine's today?" (written in 1953 and still true today!) So let us consider the principal factors producing this type of failure and the important role maintenance plays in its prevention. Cylinder hold-down studs, crankcase thru-bolts, and connecting rod bolts are a few examples of critically stressed parts subject to alternating loads. The manufacturer always gives them a specific nut torque range which must be maintained to prevent failure. The minimum torque value is necessary to avoid fatigue failure and the maximum to avoid exceeding the tensile strength of the stud. The vast majority of these failures experienced during engine operation result from fatigue. The nut is too loose, not too tight. When a nut is tightened too much often the nut yields or the stud pulls. To give a better understanding of stud and bolt fatigue failure, we wish to review some typical applications via a simple illustration. Take a rubber band and note that it stretches in direct proportion to the amount of pull up to its useful (elastic) limit. Any change in stretch shows a corresponding change in load; a constant amount of stretch shows a constant load. Now, wrap this band tightly around two pencils. Assume that they are being held together with a force of two pounds. If you try to separate them with a force of one pound, what happens? Nothing that one can see - the pencils don't separate; the rubber doesn't stretch. And the rubber doesn't "feel" the pull. Why? The rubber band was pre-loaded to a greater force than you applied. The one pound pull only reduced the pressure between the pencils (from two pounds to one pound) and the rubber doesn't know the difference. It will not stretch further until the pull is greater than two pounds. If the band is made of metal instead of rubber and a load exceeding two pounds is applied intermittently, it will fail eventually from fatigue. To prevent fatigue failure, the preload must be equal to or greater than the alternating load imposed. This principle applies to the cylinder hold-down stud and the other examples mentioned above. Consider the crankcase cylinder pad as one pencil, a portion of the cylinder base flange as the other, and the stud as the band. The flange gets a terrific tug at every combustion chamber explosion but the stud should not feel it - the design pre-load is greater than the pull of the flange. If the stud does feel it, the actual pre-load is lower than the design pre-load. Therein lies the story - "Another broken stud." The solution to this problem sounds simple. Just apply and maintain proper pre-load. But in actual practice a few complications arise. 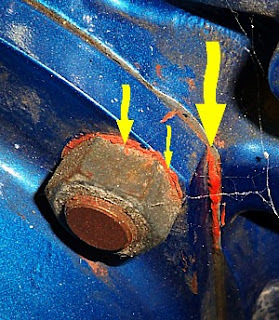 First, the torque method, which is far from fool-proof, is used to obtain a pre-load on the stud. But will all the cylinder hold-down studs get the same pull if each is tightened the same amount? Only if all conditions that resist the nut from turning are equal - thread lubrication, condition of the threads, condition of the mating surfaces, etc. It is important that they be kept as uniform as possible by giving close attention to the physical condition of the mating parts and abiding by the pertinent engine manufacturer's recommended procedures. The torque method has its drawbacks, but it is much better than guesswork and the best method generally available in the field. The pre-load must remain unchanged. But, if the mating surfaces are not sufficiently hard (as in the picture above) and smooth, they can become indented during engine operation from the pressure exerted by the pull of the stretched stud or bolt. We have discussed how a stud or bolt stretches in direct proportion to the pre-load applied. The stretch also will vary in direct proportion to the effective length of the loaded part. For a cylinder base stud, which is relatively short, the actual amount of stretch is very little - somewhere in the neighborhood of .002 inch. What happens if its nut sinks .001 inch into the cylinder flange during engine operation? The pre-load is cut in half. The stud receives an alternating load many times a second. There is one chance of survival- a continued collapse of the mating surface more than another .001 inch. Then the nut will be finger-loose due to the slight clearance between the nut and the flange (except for intermittent contact permitted by bending of the flange), and the troublesome alternating load will vanish. Of course, other studs now will be overloaded and the cylinder base flange's load will be lopsided. The agony may be prolonged but eventually something is going to give. One of the biggest culprits affecting cylinder base stud breakage is the practice of using goop and sealants under the nut or flange. This discussion has dealt with the man with the wrench. The integrity of an engine is very dependent on the man who puts it together. This article is from "Engine Conditioning Summaries" produced at McClellan AFT in the 1950's. The problem of improperly torquing cylinder base studs has not changed in 60 years. Nice little article on proper torquing of studs, through-bolts and torquing in general. Good physics lesson too.